Furniture: Comfortable, adjustable-height chairs on wheels permit students to work individually or in groups at their tables. Technologies: Access to resources: table-top power plugs for student laptops, LMS, internet (via student laptops). Multiple sources and screens for simultaneous display of different learning materials. Lecture recording permits individual review of courses materials after attending class. Lighting/colour: Appropriate lighting for individual work. Yellow accents on tabletops and other surfaces brighten the room. Layout: Promotes face-to-face communication with a unique small group table design on each tier. Students can move about classroom with ease due to centre aisle. Unobstructed sightlines. Furniture: Chairs on wheels permit students to turn and discuss with those nearby, supporting a variety of collaborative learning approaches. Rounded tables allow students to work together collaboratively in small groups of up to six. Technologies: Shared workspaces on writable whiteboards at each table. Videoconferencing permits collaborating with students at external sites. 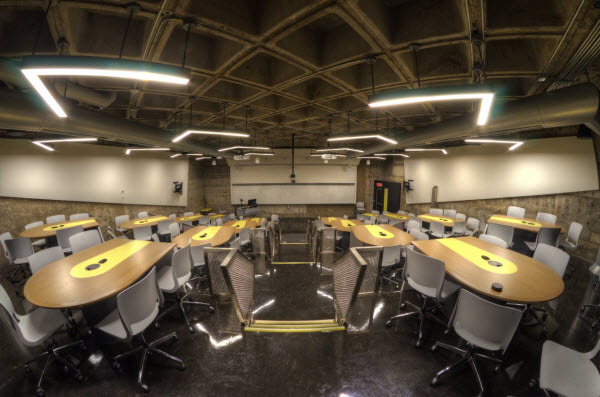 Acoustics: Sound zones support multiple simultaneous conversations among students. Appropriate amplification is available, with a push-button microphone for students at each table. 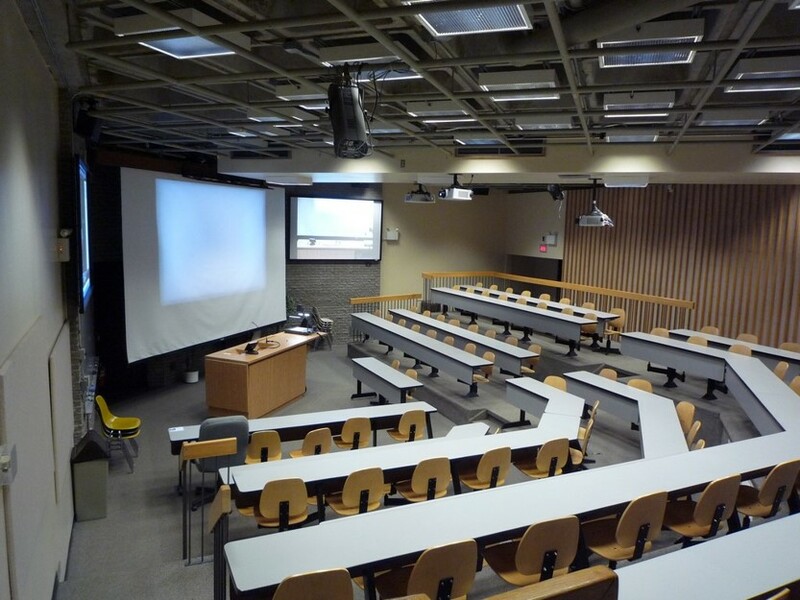 Layout: Instructor is not limited to the “front of the room” and instead has access to all students due to unobstructed sightlines and the centre aisle. Technologies: Dual-source projection, multiple classroom technology sources (document camera, data projector, computer, Sympodium, etc.) and multiple screens permit display of different learning materials. Videoconferencing feedback screens permit the instructor to view the image on the screen that is being projected to an external site.